Victoria (Vicki) Bacon was born in Los Angeles and raised in Long Beach, California. A student of the University of Southern California's Preparatory Division, she also attended the Music Academy of the West and graduated from California State University at Long Beach, with a Bachelor of Music degree in cello performance. Her teachers were Gabor Rejto, Edgar Lustgarten, and Bernard Greenhouse. During the summers, Victoria has performed for the Pageant of the Masters in Laguna Beach, Long Beach and Pacific symphonies, and the Flagstaff and Carmel Bach festivals. 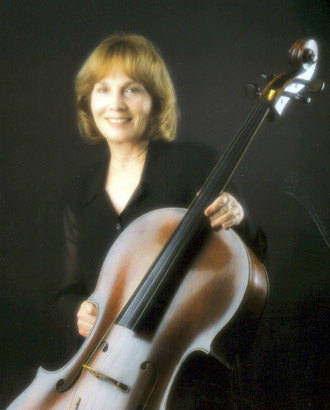 She has played in the Debut Orchestra, the Utah Symphony, Long Beach Opera, Long Beach, Downey, Pacific and Orange County (principal cello) symphonies, Ballet West, New York City Ballet, Disneyland's Candlelight Orchestra, The Gary Bonner Singers Orchestra (principal cello), and The Fab Four (Beatles). Musical theater experience has included playing for the Long Beach Civic Light Opera, the theaters of La Mirada, and San Gabriel and the Laguna Playhouse. Victoria has performed with a variety of chamber groups, including La Mer Quartet, the Lyric String Quintet, Pacific Strings, the Renaissance Players and a Long Beach Symphony string quartet (part of LBSO's education program).